After one week and a few days, one thing we’ve noticed in Waffles, our maltipoo puppy, is his terrible breath. And even though it has never been a pleasant smell, it is always far right after he wakes up. The dog version of morning breath! And so as a joke, we thought we’d let him play with a small whole lemon. Any drops of the lemon juice that made it into his mouth would hopefully freshen his breath. The lemon was small enough for him to grab with his mouth and run around with. Part of me was hoping for a puckered sour reaction, similar to when an infant tastes a lemon for the first time. In Waffles, it was not nearly as funny, but still entertaining. Waffles was unquestionably confused when he took his first bite into the lemon. He would take a bite to grab the lemon like a ball, take a few steps, spit it out, and run around the room. He’d occasionally let out a puppy bark as he examined the lemon up close, at times pawing at it. Before long, he would repeat the whole process. He easily went about it for about 10-15 minutes until we read online that lemons and other citrus fruits are not good to feed to dogs. We then immediately threw the lemon into our compost bin. Luckily we didn’t peel the lemon, so Waffles probably got a very small dose of lemon juice if any at all. According to DailyPuppy and the ASPCA, the lemons are toxic to dogs and can cause side effects including diarrhea, throwing up, and light sensitivity. It is the psoralen compounds and aromatic oils that are poisonous. In my opinion, having Waffles play with a lemon was fun and entertaining for everyone, but I’m unlikely to do it again now that I know lemons and poisonous to dogs. 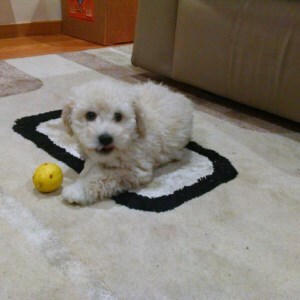 There are also plenty of YouTube videos of puppies playing with lemon, such as this and this. All About Waffle's, my Maltipoo! This is the story of "Waffles" life as we learn the basics in raising and training a puppy. Our First Night with Maltipoo "Waffles"! Puppy Loves Fetch... But I'm Bored! What's the Best Puzzle Toy for my Dog? Are Virbac C.E.T. Oral Hygiene Chews Effective? A Durable Dog Toy with a Squeaker can't be Ripped Out?